06 March 2015: Forgot to mentioned that the textures featured in this post are taken from CGTextures. I recommend creating an account to benefit from the large library of useful textures especially so for matte painters and texture artist. 02 March 2015: Revised post with picture examples. Most first time Nuke users will get the impressions that Nuke transform node is not as powerful as Photoshop transform tool. 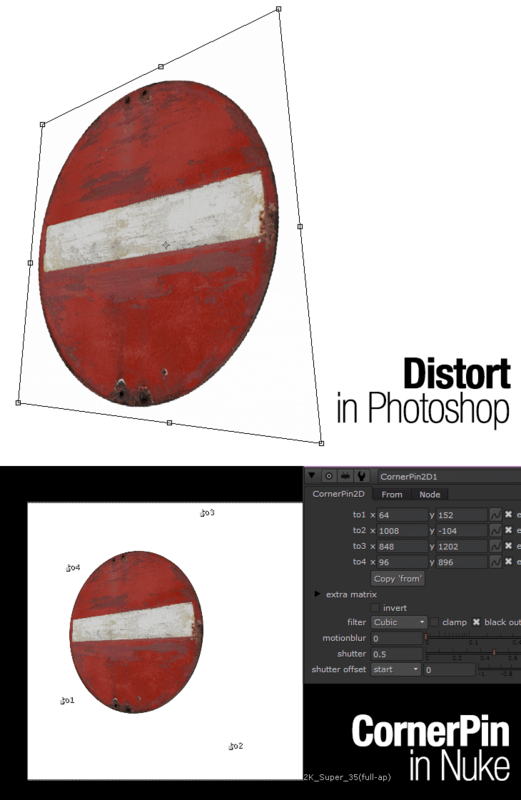 That doesn’t means any Nuke users can’t benefit from Photoshop robust transform tool. Here is a list of commands that one can execute in Nuke with their equivalent Photoshop function. I will update this post with more examples in the future which I’ll notify through the front page update and my Twitter account. 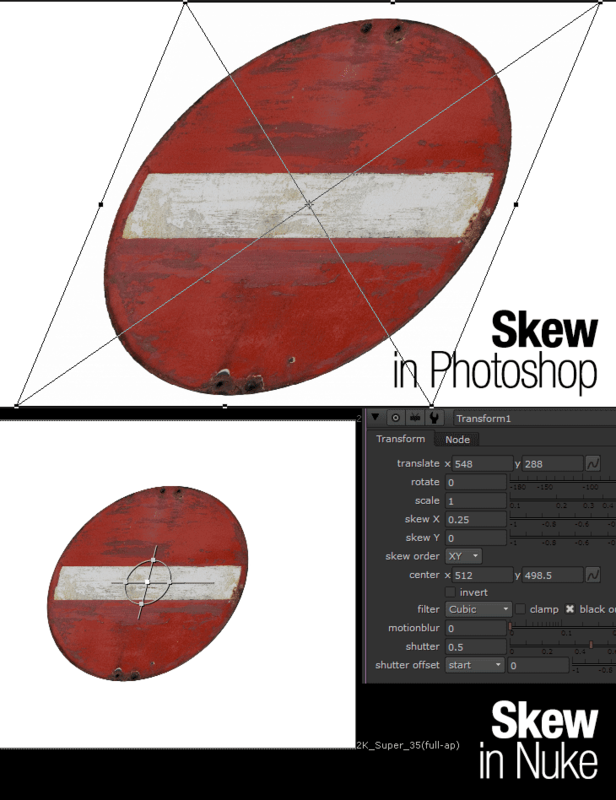 You can use the Skew X/Y in the Transform node BUT the problematic part in Nuke is that skewing affect both ends of the same axis. To combat this, you need to use Corner Pin and offset the same value on the side that you wanted to skew. 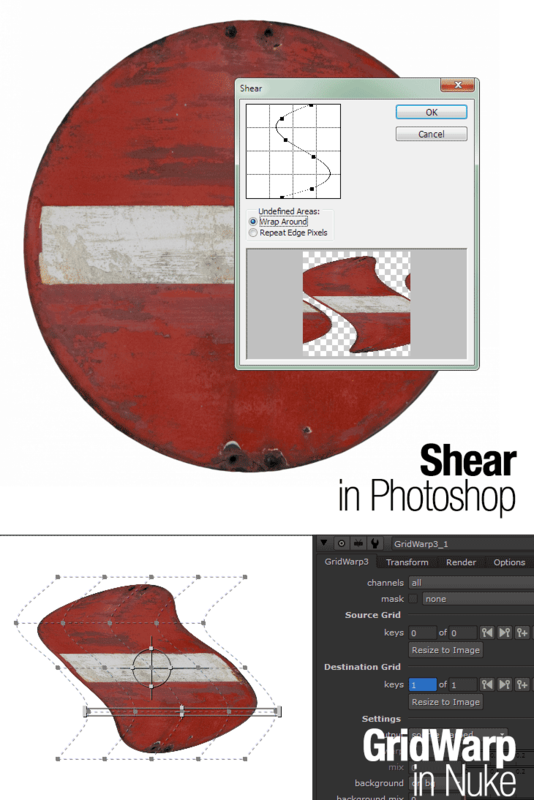 I rarely use the Shear filter in Photoshop but if you need something similar in Nuke, Grid Warp is your best friend with more powerful features compared to the Shear filter! Alternatively, you can try the Spline Warp which offer similar function but the execution is different than GridWarp as you create bezier curves to distort the affected area around the path. 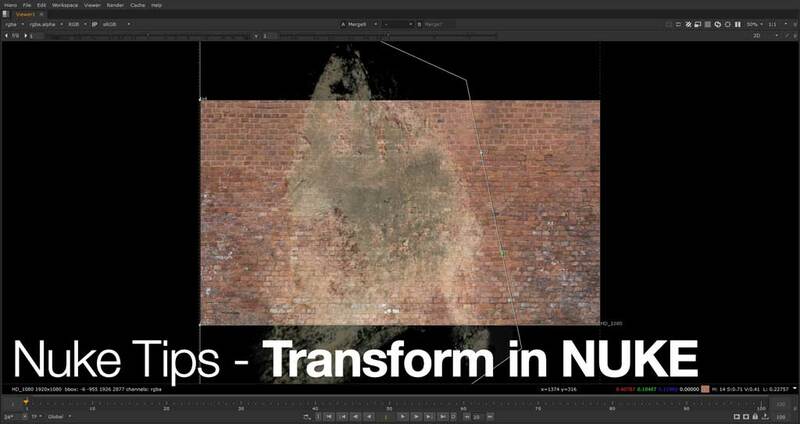 If you frequently distort images in Photoshop (especially true if you are a matte painter/texture artist), you will find it odd that the Transform node in Nuke doesn’t offer a Distort function. Turns out you can use Corner Pin which offer exactly the same function like the Distort transform. Remember that every transformation will slowly degrade the image quality if you are not careful with the resampling process aka the filter settings. The good part with Nuke is that transformation does concatenation with every subsequent transform node. For example, a Transform node that is follow up by a Corner Pin node will only degrade once as the process concatenate. Let’s say you apply a Blur node in between the Transform and Corner Pin node, this will break the concatenation process of the transform and resulted in twice the amount of degradation of the image quality.